Situated within the Compiègne forest, Le Nid dans l'Arbre or ?bird's nest? offers truly unique accommodation amongst the treetops. Most of the individual tree houses are accessed by a zip line and a free breakfast is delivered by cable. Marked trails through the forest are provided for cyclists. Grimp à L'Arb has a range of tree climbing activities in Pierrefonds, 7.5 km away. Le Nid dans l'Arbre is 22 km from the A1 motorway. Chateau de Compiègne is 10 km away and the Asterix Theme Park is a 45-minute drive. Free parking is available on site. Late check-in (until 8.00 pm) is possible at an additional cost. This double room has a kitchen, stovetop and microwave. This heated tree house has a country-style décor and wooden floorboards. Environmentally-friendly dry toilets and showers are located in separate buildings on the ground. 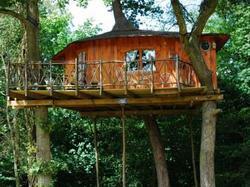 Only children over the age of 10 can be accommodated in this tree house because it is accessible by zip line. This heated suite has a country-style décor and wooden floorboards. Environmentally-friendly dry toilets and showers are located in separate buildings on the ground. Only children over the age of 10 can be accommodated in this tree house because it is accessible by zip line. This heated tree house has a country-style décor and wooden floorboards. Environmentally-friendly dry toilets and showers are located in separate buildings on the ground. This heated tree house features a large terrace and is accessed by stairs. It has a country-style décor and wooden floorboards. Environmentally-friendly dry toilets and showers are located in separate buildings on the ground.